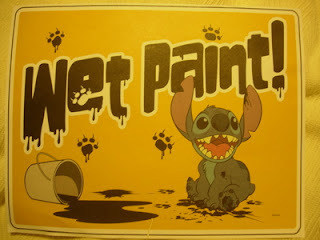 This is a "Wet Paint" sign, featuring Stitch (of Lilo N Stitch fame). I got this at the Villas Disney's Wilderness Lodge at Walt Disney World in Florida, when I stayed there in June 2007. There was a Disney cast member painting the walls, and I saw him with the signs and I asked him if I could have one. He said yes, and now I have it. Notice the little bit of paint near the bottom, in the middle.